… is that they don’t go where you’d think they should go. 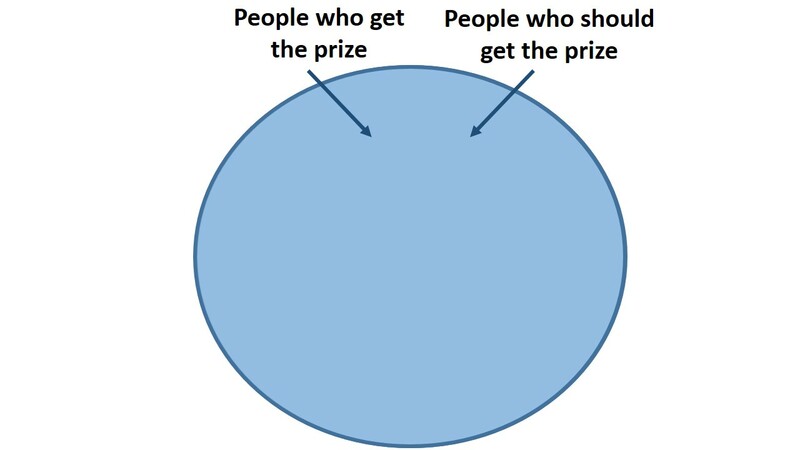 Badly-organised prizes are characterised by rewarding people who nobody thinks should be rewarded. A good example is elections which are obviously rigged: nobody believes that the ‘winner’ should have won. Well-organised prizes recognise precisely the people they should recognise. The Venn diagram is like this. The Wimbledon Championships this year is a good example: everybody thinks that Marion Bartoli and Andy Murray should have received the singles prizes this year, because they got to the finals and won. No negotiation, no subjective judgement, no disagreement. Though you might think it was kind of weird that so many top women flunked out making Bartoli’s path strangely easy (she didn’t play any top 10 player all tournament), nobody disputes her prize. Royalty is another example: there’s no debate about who gets the crown, irrespective of any discontent about the rules of succession or indeed the whole monarchy system itself. 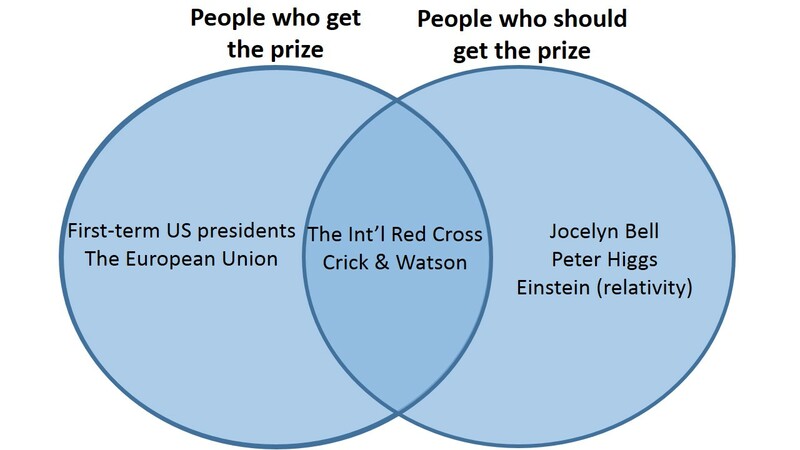 In Nobel Prizes, the overlap between the circles seems uncomfortably small. The group of people who ought to get it and who do get it – the intersection – includes the International Red Cross (Peace), Crick & Watson for discovering DNA (Medicine) and so on. But there seem to be many recipients who don’t obviously merit it, such as President Obama in his first year in office, and the European Union. Since literary genius and contribution is often contested, I imagine that many literature prizes are controversial. On the other side of the Venn diagram, there are many people and organisations who one thinks should get it but don’t. The physicist Jocelyn Bell is perhaps the best example: her discovery of pulsars landed Nobel Prizes for her two (male) supervisors but not for her. (She’s still alive, so it’s not too late for the Nobel Committee to correct.) Einstein never got one for relativity – arguably the greatest achievement of the human mind – despite empirical evidence (a prerequisite for the Prize) during his lifetime. Another example might be physicist Peter Higgs for his accurate prediction of the particle which bears his name. It’s possible that that Higgs is ineligible because his predication resulted from a collaboration between many people and the Prize can be shared by no more than three people, though it could be awarded to CERN, for finding the particle, because organisations can receive it. A further problem is the list of subjects. It excludes maths or anything related to technology, yet includes peace and literature which are unavoidably subjective and hence controversial. To see the limitations, try to figure out in which category could recognise Tim Berners-Lee’s invention of the internet, or contributions to international poverty alleviation. Such developments are perhaps the real dynamite of our time.